Copyright 2002 - 2014 IForgeIron, All rights reserved. I was working on a hammer out of some two inch stock from an axle today, working by myself, and just couldn't manage to keep the stock in the right position. 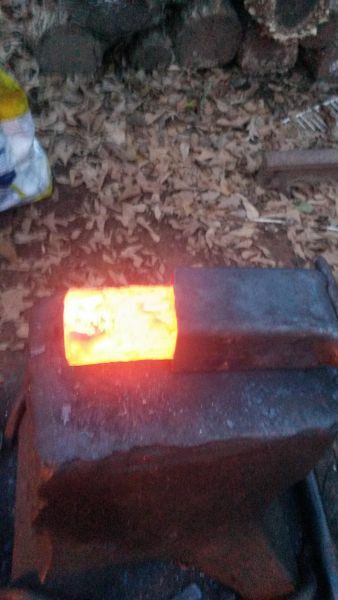 My anvil's missing the heel, so no hold down in the pritchel or hardy. And of course every time I'd try to hit the punch against the stock it would roll, even after putting a bit of a flat on one side. So.....I put a little bit of a taper on one end where the peen is gonna go, and wedged the tapered end into a piece of square tubing. It worked a lot better, and if I was working something a different size, I think I could just bend the tubing to fit. I suppose you could work it in the vise.....but this seemed like a good idea and thought I'd share. Feel free to criticize or add your own ideas. How does that work? Is there something off to the right side affixing it to the anvil or does it just cap the part you are working on? I put a little bit of a taper where the peen will be, and it's lightly wedged into the square tubing to keep it from rolling while I'm punching. No hardy on my anvil since the heel's broken off, and I got tired of it moving on me. The tubing's just sitting there, no attachments, but between it and holding the punch in one hand, I had a lot more control. With smaller stock I could ding the tubing in a little for a smaller diameter. Theres a forum for it under shop tricks. Great thinking ... I love it when smiths adapt to a problem.... Another method is to form a saddle of 3/16 or so stock about six inches or so for the anvil face. edges down about 3/4 inch.... Than tack weld some 1/2 bar stock to form a hold area for your stock to be punched... For drawing out weld a 3/8 bar to the end until you have enough to use tongs..
Take a piece of bicycle or motorcycle chain. Make a pin or hook on the side away from you, to hold the end of the chain. Make a foot hold like a stirrup on the other end of the chain. Hook the chain so it is the correct distance to hold your piece, when your piece is hot tuck it under the chain, put your foot in the stirrup and press down. There was a guy in a hammer class a few months ago that used a half round die in the classroom swage block to keep his round blank in check while punching the eye. You could cut a pipe in half and make a similar swage as a saddle for the face rather than a hardie tool as well. Good thought on the tubing, that's a very elegant solution with minimal fuss. Rather than the stirrup I use a board attached to the chain. Step on the chain. I have large feet and it's easier for me.